Hainan will conduct intensive cooperation with neighboring regions in the next few years in an effort to become an international tourism destination, the province’s top official announced. 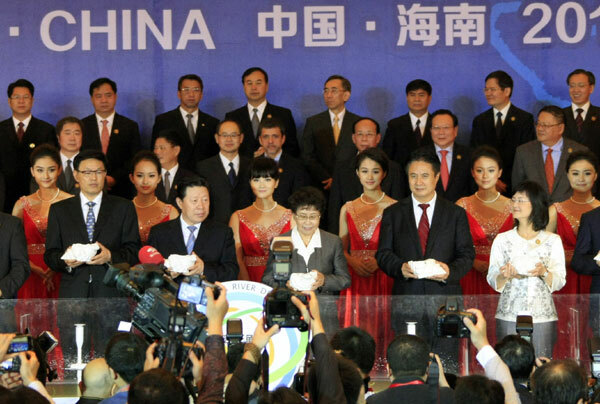 He was speaking at the opening ceremony of the Eighth Forum on Pan-Pearl River Delta Regional Cooperation and Development on Thursday in the provincial capital city of Haikou. "All parties are welcome to take part in building Hainan into an international tourism island and share dividends of green development," Luo Baoming, Party chief of Hainan province, said in a speech during the opening ceremony of the business forum, which ends on Sunday. Nearly 10,000 participants, including representatives of both domestic and overseas enterprises, are taking part in the forum, according to Li Guoliang, vice-governor of Hainan. The intensive cooperation with other parties in the river delta over the next few years will be in a wide range of areas, including oil exploration in the South China Sea, transportation and tourism, Li said. Supported by China’s central government, Hainan, the southernmost island province that lies in the South China Sea, aims to become a shopping paradise for Chinese and international visitors. Measurers that have been taken include a duty-free policy that allows visitors to buy goods with tax rebates. The Pan-Pearl River Delta region covers the provinces of Fujian, Jiangxi, Hunan, Guangdong, Hainan, Sichuan, Guizhou and Yunnan, the Guangxi Zhuang autonomous region, and the Hong Kong and Macao special administrative regions. It covers one-fifth of China’s total area and is home to one-third of China’s total population. Contracts for a total of 17,300 projects worth more than 2.6 trillion yuan ($417 billion) have been signed in the first seven Pan-Pearl River Delta business forums. Gross domestic product of the nine mainland provinces and autonomous regions in the area totaled 15.2 trillion yuan last year, accounting for 32 percent of China’s total, according to Tang Hao, a senior official of the forum.